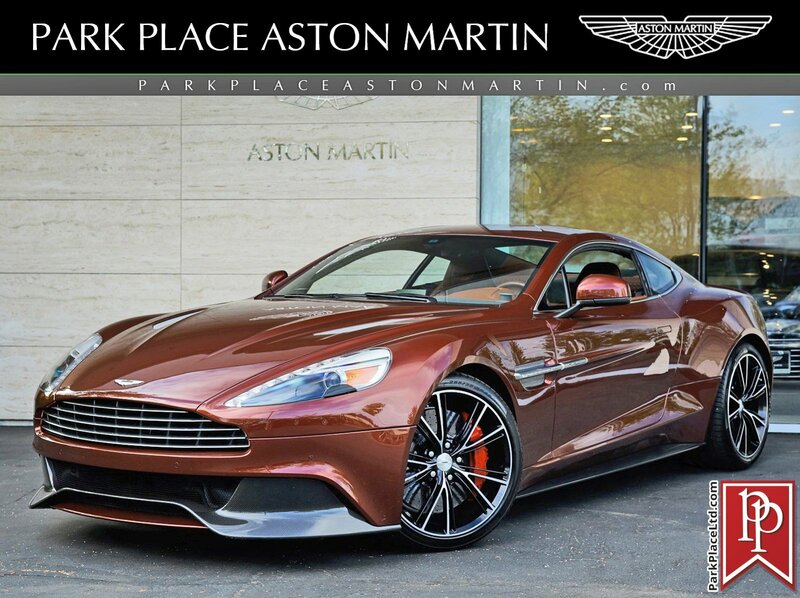 Park Place Aston Martin, the Northwest's Aston Martin Headquarters, presents this stunning 2014 Vanquish Coupe. This particular 2014 Aston Martin Vanquish 2+2 Coupe, (#00619), was a special order that was configured to a client's personal specifications - and they did a masterful job of crafting a most impressive car. It is absolutely gorgeous and has only 29,794 pampered miles from new. Vanquish is a masterpiece in automotive design and is visually captivating, with this example being impeccably finished in alluring Bridgewater Bronze Metallic, an optional 'Q' colour, over an opulent 'Contemporary' interior tailored in the finest Bridge of Weir hides coloured in a rich Chestnut Tan with Obsidian Black accents, contrasted with Lords Red stitching throughout -- it is truly amazing in its beauty. The All Carbon Body Vanquish is powered by a hand-built 6.0-Litre V12 Engine, that sends power to the rear wheels through a lightning-quick and silky-smooth 6-Speed Touchtronic II Transmission. Aston's racing-derived Carbon Ceramic Brakes are very capable of rapidly diminishing high rates of speed. This fabulous Vanquish carried an original MSRP of $313,640 and was ordered with a most impressive list of elective features, consisting of; 20" 20-Spoke Diamond Turned Wheels in Satin Black ($5,680), 2+2 Seating Arrangement ($4,545), The aforementioned Special Aston Martin 'Q' Paint Colour (the spectacular Bridgewater Bronze Metallic) was $3,785, and the previously noted Chestnut Tan Leather/Obsidian Black ($1,595) along with the Lords Red contrast stitching ($570). The Quilted Leather Seat Accent is a glorious option that added $3,785 to the Sport Seats, Heated & Ventilated Front Seats ($1,595), Red Coloured Brake Calipers ($1,595), Magnum Silver Meshes ($750), Full Fascia in Herringbone Carbon Fiber ($3,190). This Vanquish is nearly flawless throughout. Books, records, recent Aston Martin Dealer service, and runs and drives like new, representing a fantastic opportunity to add one of the most exclusive cars ever crafted to your collection at a fraction original sticker - Don't miss out. All of Park Place Aston Martin's pre-owned inventory undergo a rigorous pre-sale inspection at our Factory-Authorized Service Center and this pristine example is ready for its next owner to enjoy 'The Aston Experience'. Vanquish is the flagship of the Aston Martin lineup and is a return of the famed marque to a place among the top of the newest generation Supercars. The Vanquish is built on Aston Martin's renowned VH architecture with an all-carbon fiber body and is powered by a 6.0L V12 powerplant under the hood that develops an incredible 565hp and 457lb-ft of wheel-twisting torque. The performance-oriented engine is backed by a 6-speed TouchTronic II automated gearbox, performance suspension and massive carbon ceramic brakes that provide ample stopping power when called upon with virtually no fade. Inside the cabin, this Vanquish showcases impeccable Bridge of Weir hides in on virtually every surface. The front sport seats are power adjustable and feature heating and optional ventilation, as well as, memory settings for driver and passenger. Further notable cabin features include a premium Bang & Olufsen BeoSound audio system, Bluetooth telephone connectivity, iPod integration, satellite navigation & radio, front & rear parking sensors, and reversing camera. Outside, the optional Bridgewater Bronze Metallic paint is contrasted with a bright silver grille and meshes, and optional 20" diamond-turned wheels have replaced the standard issue. Standard Vanquish features include a superior 1,000w Bang & Olufsen BeoSound audio system, Bluetooth telephone connectivity, satellite navigation, iPod integration, front and rear parking sensors, and a rear-view camera. This very special Aston Martin is available for viewing in our Bellevue, WA showroom. For more information on this fabulous 2014 Vanquish or any of our 10+ Aston Martins always in stock, or to discuss configuring and ordering an Aston Martin to your personal specifications, contact one of our friendly and knowledgeable sales consultants or always feel free to drop by our Bellevue, WA showrooms - Home to an exciting inventory of luxury, exotic, sports and collectible cars with 200+ always on site. Nobody Has What We Have!